The State of the Nation's Housing 2013 report is out, and it points to two important things about the places in which we live. First, the housing market recovery is well under way, according to the report from the Joint Center for Housing Studies at Harvard University. Second, rentals are becoming more popular — and more expensive. "Fully 89 of the 93 metro areas tracked by MPF Research saw rents climb over the past year," the report notes. "In nine of these areas, the increases were at least 5%." In fact, April 2013 marked the 34th consecutive month in which rents increased. Investors have taken advantage of this, as they represented about 20% of home buyers last year. 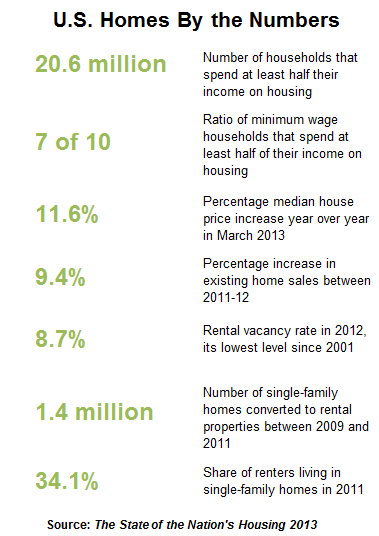 And between 2009 and 2012, 1.4 million single-family homes were converted to rentals. "In fact, with the addition of 1.1 million renter households last year, much of the increase in rental demand has been met not by new apartments, but by conversion of single-family homes to rentals," according to the report. Overall, though, the national home ownership rate continues to fall. Some 65.4% of Americans live in homes they own, down for the eighth straight year. For every 10-year age group between 25 and 54, the share of households owning homes is at its lowest point since 1976. It's disappointing the housing recovery is not being pushed forward by individual buyers, and that first-time home buyers made up only 37% of home sales in 2011 and 39% in 2012. But if you own a rental property, this could be a good sign that you made the smart choice. I was part of that home-to-rental trend. Even though I moved back in earlier this year after a breakup, I plan on being a landlord again in the near future. Owning a home is a way of forced savings. Assuming you haven't purchased an exotic mortgage, bought the home during a housing bubble or are paying more than you can afford, dropping that monthly mortgage into building equity can be a smart investment. It's also a historically great time to own. "(M)onthly housing costs have rarely been more favorable for home buyers," according to the report. "When combined with the sharp drop in home prices, today’s low mortgage interest rates have made owning a home more affordable than at any time since the 1970s." So the fact that fewer Americans own a home, whether because they can't qualify for a mortgage or save a down payment, is troubling. However, if you're like me and have owned rental properties, this report is good news and might have you thinking about buying another home.